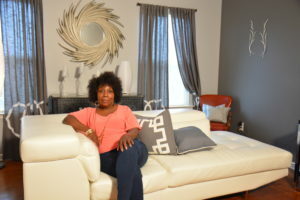 Shirley Tyus is a lady full of poise and crystal clear priorities that guide her journey through life. One look at the glimmer in her eye and her confident smile, it’s easy to believe that she can take on the world. Yet, her world was turned upside down and the path she was on became clouded when she discovered she had kidney disease. Without obvious symptoms, it’s easy for kidney disease to progress into complete, irreversible, kidney failure. When Shirley began to acknowledge the news regarding her diagnosis, she was angry. Her anger stemmed from the lack of information she’d been given over the years. “The medical system seemed to have failed me. I would go to the emergency room so many times and the staff would say, ‘Your blood pressure is a little high.’ I should have been told what that meant. I should have been told about my kidney problems early on,” explained Shirley. Unfortunately, Shirley was not aware that her history of uncontrolled high blood pressure was slowly damaging her kidneys. She abruptly found herself facing kidney failure with a multitude of questions and no clear answers. When it was apparent that Shirley’s questions were going to require more time and attention than what a standard doctor’s office visit could offer, the nephrologist referred her to Reach Kidney Care. 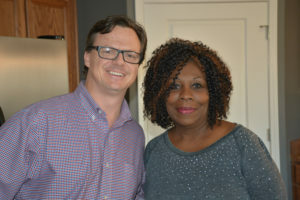 Reach Kidney Care is where Shirley met Ed Dennis, nurse practitioner, chronic kidney disease (CKD) care coordinator. In their first meeting, Ed explained what the kidneys do, how they function, what it looks like when they start to fail, and how to keep them as healthy as possible for as long as possible. After learning about kidney function and treatment options for kidney failure, Shirley decided that she wanted to explore transplant as a treatment option. Ed enrolled Shirley in an all-day transplant workshop where she was able to ask questions, speak to doctors, and sign up to be screened as a kidney recipient. After her screening, she was approved and accepted to the transplant waiting list. Shirley’s daughter, Tanya, witnessed the toll that kidney disease was taking on her mother and she couldn’t sit back and let it continue. She knew she had to do something. With the same fierce determination evident in her mother, Tanya explained she was ready, willing and able to get her mother fixed. She wanted her mother back. Two years ago, after suffering from a stroke, Shirley Tyus was diagnosed with kidney disease. Shocked by the diagnosis, Shirley set out to find ways to stabilize her health. In order to provide an extra layer of care team support, her nephrologist introduced her to Reach Kidney Care. 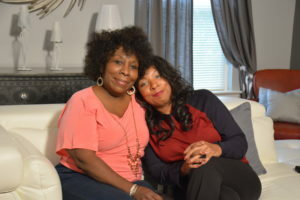 With the help of her Reach care coordinator, Shirley learned strategies for maintaining her kidney function and treatment options for kidney failure. “My transplant was scheduled for October 6, 2015. I had prepared myself mentally for the procedure. I studied the paperwork and understood the process. I came to grips with the fact that this was a serious surgery,” said Shirley. However, things were not going to go as planned. This unexpected news left Shirley confused and scared. “My first thought was, “Am I going to die now?” I didn’t really know what it meant to have the surgery cancelled so I didn’t know how to act,” said Shirley. What many people may not understand is that with dietary changes, medication adjustments and lifestyle modifications, it is possible to maintain kidney function and delay the need for dialysis or a transplant. If a person is scheduled for a transplant and his or her kidney function improves, he or she may be removed from the transplant list. Ms. Tyus’s transplant team had evaluated her lab work and found that her kidney function improved. While it may not have been welcomed news at the time, not receiving the transplant was actually good news for Shirley. Shirley has recovered from the shock of the cancelled transplant. She continues to work with Reach Kidney Care to monitor her health. Shirley’s journey with kidney disease has not been easy. However, she’s found ways to overcome her obstacles.